BALB/C mice were injected with DNA polymerase beta protein. Our Abpromise guarantee covers the use of ab1831 in the following tested applications. WB Use at an assay dependent concentration. Predicted molecular weight: 38 kDa. ICC/IF Use at an assay dependent concentration. (PMID 20019666). Repair polymerase. Conducts "gap-filling" DNA synthesis in a stepwise distributive fashion rather than in a processive fashion as for other DNA polymerases. Has a 5'-deoxyribose-5-phosphate lyase (dRP lyase) activity. Belongs to the DNA polymerase type-X family. Residues 239-252 form a flexible loop which appears to affect the polymerase fidelity. Methylation by PRMT6 stimulates the polymerase activity by enhancing DNA binding and processivity. 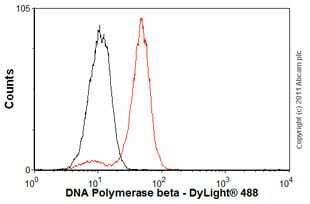 Western blot - Anti-DNA Polymerase beta antibody  (ab1831)Image from Donigan KA et al., J Biol Chem. 2012 Jul 6;287(28):23830-9. Epub 2012 May 10.; Fig S1. 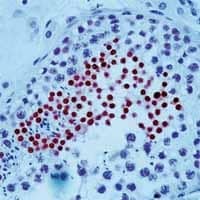 ; doi: 10.1074/jbc.M111.324947; July 6, 2012, The Journal of Biological Chemistry, 287, 23830-23839.
ab1831 staining human testis by IHC-P.
Overlay histogram showing Jurkat cells stained with ab1831 (red line). The cells were fixed with 4% paraformaldehyde and then permeabilized with 0.1% PBS-Tween for 20 min. The cells were then incubated in 1x PBS / 10% normal goat serum / 0.3M glycine to block non-specific protein-protein interactions followed by the antibody (ab1831, 1µg/1x106 cells) for 30 min at 22ºC. The secondary antibody used was DyLight® 488 goat anti-mouse IgG (H+L) (ab96879) at 1/500 dilution for 30 min at 22ºC. Isotype control antibody (black line) was mouse IgG1 [ICIGG1] (ab91353, 2µg/1x106 cells) used under the same conditions. Acquisition of >5,000 events was performed. Publishing research using ab1831? Please let us know so that we can cite the reference in this datasheet. The information that I am looking for is the concentration of the PBS (also the pH), stabilizer, and sodium azide. Thank you for your email. The antibody solution consists of 1X PBS, pH 7.5; 1% BSA; and 0.5 % sodium azide. Please contact us again if you have any additional questions. Please let me know the concentration of storage buffer, stablizer, and preservative used in your product code of Ab1831. Thanks! The storage buffer is PBS, stabilizer is BSA and preservative is Sodium azide. Please contact us again if you have any additional questions. BATCH NUMBER -- NOT SPECIFIED -- ORDER NUMBER -- NOT SPECIFIED -- DESCRIPTION OF THE PROBLEM No staining SAMPLE mouse spermatocyte spreads , paraffin sections of mouse testis PRIMARY ANTIBODY Ms Pol Beta (Abcam) 1:25 in blocking solution, incubated overnight at 4C in moisture chamber. Wash in PBS for 45 min. DETECTION METHOD fluorescent or DAB-peroxidase POSITIVE AND NEGATIVE CONTROLS USED none ANTIBODY STORAGE CONDITIONS -80C FIXATION OF SAMPLE paraformaldehyde, 2 hours for spreads, overnight for paraffin sections ANTIGEN RETRIEVAL heated sodium citrate/HCl for paraffin sections, glycine for spreads PERMEABILIZATION STEP 0.05% Triton for spreads BLOCKING CONDITIONS 5-10% Normal Donkey Serun /3% BSA in PBS 1 hour SECONDARY ANTIBODY donkey anti ms FITC 1:100 in blocking solution for spreads, Vector ABC kit (Ms) for sections 1 hr at rooom temperature. Wash in PBS for 30 min. HOW MANY TIMES HAVE YOU TRIED THE APPLICATION? 30 HAVE YOU RUN A "NO PRIMARY" CONTROL? Yes DO YOU OBTAIN THE SAME RESULTS EVERY TIME? Yes WHAT STEPS HAVE YOU ALTERED? the concentration of normal serum blocking, with/without triton ADDITIONAL NOTES It worked only once in april, 2004 on both spread and section, and got negative results many times afterwards with same protocol. 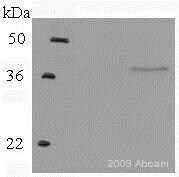 Customer would like more information regarding the purity of this antibody. Thank you for your enquiry. This antibody was purified by protein A chromatography, and the concentration is approximately 100 ug/ml. If you have any additional questions, please contact us again. BATCH NUMBER 93675 ORDER NUMBER R324750 DESCRIPTION OF THE PROBLEM No staining. I recently had a problem-using ab 1831. When I used for both immunofluorescence and imunohistochemistry I could not get any signal. Before I used yours antibody for both applications and I did not have any problem. Could you help me to solve this big problem for us? I should mention that we do not have a problem using this ab for western. I tried to find out the batch number for the ab 1831, which was working fine for us a year ago. I have already contacted with technical support person and gave him the date of purchasing the working for us AB. It was March 9 2004 and I guess the batch # is 42302. If you have some sample with this batch # could you please exchange with the last one, which did not work for us. SAMPLE mice testis PRIMARY ANTIBODY Immunohistochemistry:ab1831 1:10 dilution in 3% BSA / 1.5% Normal Horse Serum/PBS 16hrs at 4oC Wash step: 3 times 1XPBS Immunofluorescence: ab1831 1:25 dilution in PBTG (1XPBS, 0.2% BSA, 01% Tween20, 0.1% gelatin)/1:200 dil Normal donkey Serum Wash step: 3 times 1XPBS DETECTION METHOD Immunohistochemistry: ABC kit from Vector laboratories-8mklA+8mklB to 0.4ml PBS 30 min pre incubation time and add to the sections for 30 more min. at RT Wash step: 3 times 1XPBS DAB detection: dissolve DAB in 5ml H20 and add UREA/H202 filter and incubate for 5 min at RT onto section Wash step 5 min H20 Hematoxylin for 15 sec, wash once H20 Dehydrate in 70, 95 and 100 % ETOH 5 min each; two times 100% xylene-5 min each mount with: Histological Mounting medium SO-P-15 Immunofluorescence: After wash step stain with DAPI 0.25 mkg/ml for 5 min at RT Wash step 5 min H20 Dry and mount slides using Fluoromount-G +2.5% DABCO POSITIVE AND NEGATIVE CONTROLS USED For immunohistochemistry and immunofluorescence as positive control I used other Abs with the same conditions and they worked perfectly. As negative controls in both applications omitted only primary AB ANTIBODY STORAGE CONDITIONS We always use to aliquot ab1831- DNA polymerase beta in aliquot of 10 mkl and keep them at-80. Working aliquot we use to keep at +4oC no longer than 1 month. FIXATION OF SAMPLE PFA fixed spread prepared from mice testis-immunofluorescence. Formalin fixed and paraffin embedded and section form mice testis for immunohistochemistry. ANTIGEN RETRIEVAL Immunohistochemistry: 10mM citric acid pH 6.0 15 min 90-95oC. Immunofluorescence: quenched with 0.1% glycine/PBS for 10 min PERMEABILIZATION STEP Immunohistochemistry:0.1 % H202 for 20 min at RT and 0.05 % saponin in d2 H20 for 30 min Immunofluorescence: 0.5% Tritonx100-30 min at RT BLOCKING CONDITIONS Immunohistochemistry: 3% BSA / 1.5% Normal Horse Serum/PBS for 1 hr at RT Immunofluorescence: PBTG (1XPBS, 0.2% BSA, 01% Tween20, 0.1% gelatin)/1:200 dil Normal donkey Serum SECONDARY ANTIBODY Immunohistochemistry: Vector Laboratories, Biotinylated Anti Mouse IgG (H+L) made in horse Dilution 1:200 in 3% BSA / 1.5% Normal Horse Serum/PBS for 1hour at RT Wash step: 3 times 1XPBS Immunofluorescence: Jackson ImmunoResearch Laboratories anti Mouse IgG (H+L) FITC conjugated made in donkey. Dilution 1:100 in PBTG (1XPBS, 0.2% BSA, 01% Tween20, 0.1% gelatin)/1:200 diluted Normal donkey Serum for 1hour at RT Wash step: 3 times 1XPBS HOW MANY TIMES HAVE YOU TRIED THE APPLICATION? 5 HAVE YOU RUN A "NO PRIMARY" CONTROL? Yes DO YOU OBTAIN THE SAME RESULTS EVERY TIME? Yes WHAT STEPS HAVE YOU ALTERED? Checked different dilutions bud did not get results even with 1:10 dilution for both applications. I'm sorry to hear you are having problems with ab1831 in IHC. The fact that the antibody still works in WB suggests that the antibody is fine but that there is a component in the IHC protocol which is damaged, there could potentially be many "ingredients" used in the IHC protocol which are damaged and prevent good staining. We have not tested the antibody on mouse tissue and therefore cannot guarantee that it will work in mouse. Since you purchased the antibody in march 2004, it is more than a year old, and therefore it is also possible that it has been damaged during storage in your freezer, you also say "working aliquot we use to keep at +4oC no longer than 1 month", I would recommend trying fresh aliquots in case those were damaged during storage at 4C. The batch that worked was purchased on the beginning of Aril, 2004. Basically I treat mono-layer of cultured cell with SDS-loading buffer, boil it for 5 minutes before I load it into PAGE. These cells were either induced or not for the expression of a DNA polymerase beta mutant. With a good batch of anti-pol beta monoclonal antibody, I'd expect to see a single band on non-induced samples and two bands on induced samples. I hope this would help. The Reference number is: 56538 (PON: R3012207). The date of purchase is Oct.13, 2004. The problem with this batch of antibody is that there's no signal on the membrane with high dilution. Background is minimal so what I got is a blank blot. I don't have the batch number of the antibody that worked since I don't have the original tube. My samples are cellular extract. I had no problems with the batch that worked. I had tried this batch (60820) many times with the exact protocol. My finding is that if I don't dilute it to 1: 200, there will be no signals. So I am pretty sure this batch of antibody has lower titer compared with the older batch (dilution: 1:1000). Considering those, I think we should get another batch of this antibody without charge to test until we can get good signal. Thanks a lot for your time! I recently ordered anti-DNA polymerase beta-ab1831, batch 60820 from your company. The same antibody we ordered before used to work well for Western blot with a dilution of 1: 1000. But this batch never worked at this dilution until it's increased at least to 1: 200. So can you help me find out what's wrong? Thanks a lot! Thank you for the information. We have not received any other complaints regarding this antibody and since the previous vial of ab1831 worked for you, it sounds like perhaps there is a problem with the latest vial that you received. I'm sending you a replacement vial free of charge and for your record it is being shipped to your attention on Abcam order# 62985. You should receive this tomorrow. Please let me know if you have any additional questions and please also let me know how the replacement works out for you. The Reference number is: 56538 (PON: R3012207). The date of purchase is Oct.13, 2004. The problem with this batch of antibody is that there's no signal on the membrane with high dilution. Background is minimal so what I got is a blank blot. I don't have the batch number of the antibody that worked since I don't have the original tube. My samples are cellular extract. I had no problems with the batch that worked. I had tried this batch (60820) many times with the exact protocol. My finding is that if I don't dilute it to 1: 200, there will be no signals. So I am pretty sure this batch of antibody has lower titer compared with the older batch (dilution: 1:1000). Considering those, I think we should get another batch of this antibody without charge to test until we can get good signal. Thanks a lot for your time! Thank you for your email. I can send you a replacement vial of ab1831, it is no problem. But can you be more specific regarding the samples that you are using? Also, when approximately did you order the vial of ab1831 that did work for you? That information will help me to determine which batch it was. Thank you, and I look forward to hearing from you.